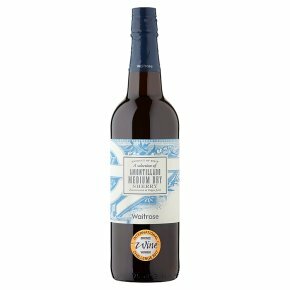 Full flavoured, medium dry Amontillado sherry from Spain. Waitrose Blueprint wines are crafted to reflect the world's classic regions and styles. Medium-dry, rich and mellow, this has flavours of dried fruit and roasted nuts with enticing depth of character and a long finish. Perfect with chorizo, tapas or hard cheeses.